Robbie Williams says that living in a society that accepts therapy and the concept of addiction as a disease has helped him in his recovery from pain killer and alcohol addiction. 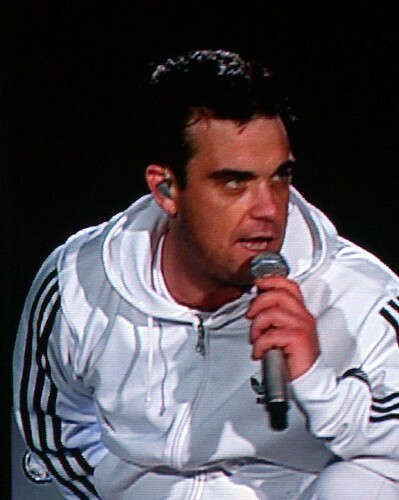 Robbie Williams says L.A. living is good for the soul. The singer, who’s been in and out of rehabs several times over the last decade for addictions to alcohol and prescription medications says that people’s acceptance and understanding of his condition make it easier to get help – which is in sharp contrast to an attitude that persists in England. He explains, "I can say it's easier in Los Angeles - everybody talks therapy out there. There's a much better understanding of addiction, depression and ailments in general. There's very much a stiff upper lip in England. These days people are softening, people are going to Alcoholics Anonymous and rehab, but it's taken us a long time to stop the stiff upper lip." In addition to the understanding of those in his adopted city, Williams also credits his girlfriend, actress Ayda Field who he calls ‘wonderful’ and says helps his mental stability and recovery. When asked about rumors that have him writing his memoirs, Williams admits he wouldn’t mind doing so but concedes that his excesses of the last years have left him with a few sketchy periods of memory.